Not to be confused with Burrbo. Barbos is a giant Lurchin and a boss appearing in both Donkey Kong Country 3: Dixie Kong's Double Trouble! and Donkey Kong Land III. She is the mother and supposed leader of the Lurchins. Enguarde fights Barbos in Donkey Kong Country 3. In Donkey Kong Country 3, Barbos is the boss of the sixth world, Razor Ridge, and is fought in the level, Barbos's Barrier. 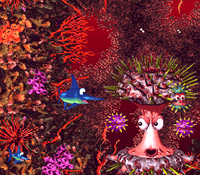 As Barbos lives underwater, Dixie Kong and Kiddy Kong can only fight her by transforming into Enguarde the Swordfish. Barbos first attacks the swordfish by sending her Lurchin children after him. Enguarde must stab the Lurchins into the spiked balls protecting Barbos. Once out of the way, Enguarde can stab into Barbos's soft body. After being hit, Barbos drops down to the next level and begins shooting Missile Shells at Enguarde. Enguarde must also lure the Missile Shells into the spiked balls protecting Barbos. After getting rid of them, Enguarde can stab Barbos again. On the final and lowest floor, Barbos shoots spikes at Enguarde. After avoiding the spikes, Enguarde must quickly go up to Barbos and stab her. After stabbing Barbos two more times, Barbos is defeated. When Barbos is defeated, she releases a Bonus Coin (or a Bear Coin in rematches). However, even when defeated, Barbos can still hurt Enguarde if he swims into her. In the Game Boy Advance port, Barbos and her domain were relocated to the end of Pacifica. Kroctopus takes over Barbos's position as the boss of Razor Ridge. In this version, Enguarde only has to hit Barbos four times to defeat her, more specifically by stabbing her twice on the third and lowest floor. In Donkey Kong Land III, Barbos appears as the boss of the first world, Cape Codswallop and is fought at Barbos Bastion. 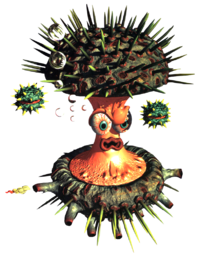 Like in Donkey Kong Country 3, the Kongs are forcefully transformed into Enguarde, who must smash three Lurchins into Barbos's face to defeat her. Each time Barbos is hit, she fire three Lurchin shells at Enguarde, who must avoid them because he cannot attack them. This page was last edited on February 27, 2019, at 19:46.